Girina O.A., Ozerov A.Yu., Nuzhdina I.N., Zelenski M.E. 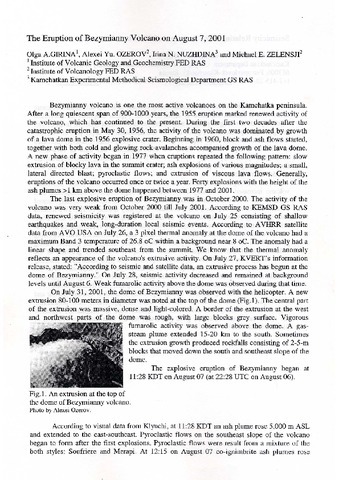 The Eruption of Bezymianny Volcano on August 7, 2001 // Abstracts. 3rd Biennial Workshop on Subduction Processes emphasizing the Kurile-Kamchatka-Aleutian Arcs (JKASP-3). Fairbanks. June 2002. 2002. P. 110-111. Girina O.A., Romanova I.M. 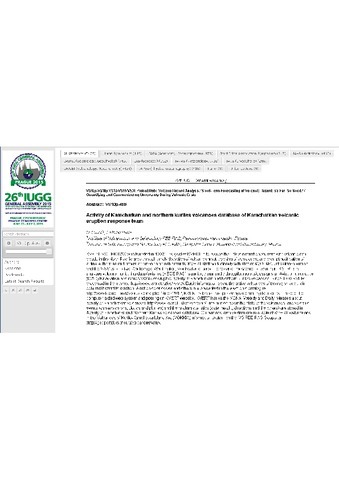 Activity of Kamchatkan and Northern Kuriles volcanoes database of Kamchatkan volcanic eruption response team // 26th IUGG General Assembly. June 22-July 02, 2015. Abstracts. Prague: IUGG/IAVCEI. 2015. P. VS10p-456. Girina O.A., Romanova I.M. 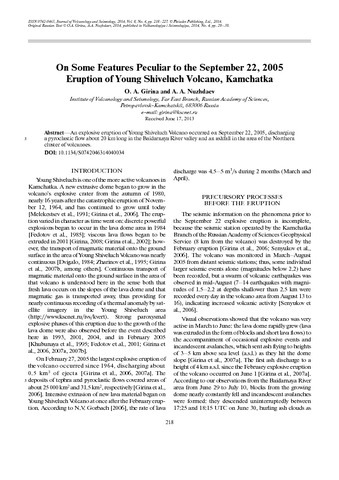 Kamchatkan Volcanic Eruption Response Team (KVERT) Data in Internet // Modern Information Technologies in Earth Sciences. Proceedings of the International Conference, Petropavlovsk-Kamchatsky, September 8-13, 2014. Vladivostok: Dalnauka. 2014. P. 145-146. 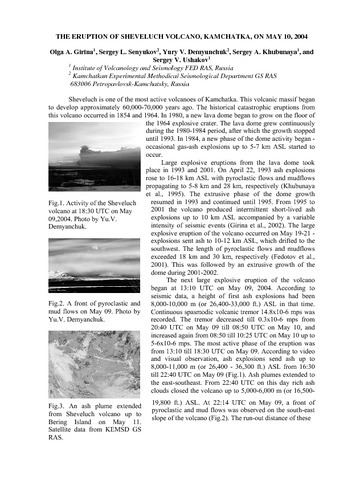 Study is made for the first time on morphological peculiarities of microstructure of three samples from the unbroken marker ash layers of the Shiveluch volcano. In this paper we give the qualitative analysis of tephra structure, i.e. size and shape of particles and type of microstructure, describe structural relationships between deposit components, etc. and make the quantitative analysis of porosity of Sh2 and Sh1 tephra at magnification of 200 and 1,000. Hollow globules of volcanic glass were found for the first time in Sh2 ashes. Girina O.A., Senyukov S.L., Neal C.A. 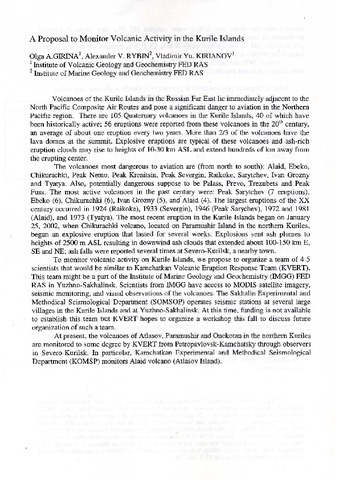 Kamchatkan Volcanic Eruption Response Team (KVERT) Project in 2004-2006 // Abstracts. 5rd Biennial Workshop on Subduction Processes emphasizing the Japan-Kurile-Kamchatka-Aleutian Arcs (JKASP-5). 2006. P. 161-162. doi: P 618.